Now that there are some seasoned SPIN farmers out there, I'm seeing lots of plans for taking their operations to the next level. Many involve expanding their land base or investing in season extension. Both are good ideas. But accomplishing them the traditional way - by acquiring more land or investing in complicated structures - makes it harder and more expensive than it needs to be. A few years ago when I wanted to expand my operation, I headed to the basement. The investment was under $1,000, and included some shelving and lights. Since I am already spending to heat that room, the overhead is just the cost of lights, which is minimal. Bottom line: you don't need to invest in a new structure, or find space for it. Right now in one of my basement grow rooms I have 50 trays of pea and micro greens, with turn around of less than two weeks. I will also be growing live garlic in containers, starting this week, in another grow room. Bedding plants are scheduled for next month. Other possibilities for indoor grow room production are fresh herbs, something I will try soon. My basement grow room now adds $10,000+ to my bottom line, and supports a year round operation in zone 3 Canada. Being an urban farmer, I also appreciate its discretion. In my neighborhood, a 50 foot high tunnel in the backyard would not go unnoticed. Using underutilized residential spaces I already have is an easier option. This type of indoor setup allows you to grow consistent volumes of crops year round, regardless of whether you are having a hot summer, or a cold, hard winter. Being able to provide steady supply locks in restaurant customers. Year round restaurant orders of indoor crops of say, $200 per week, means an extra $10,000 per year, with minimal time and labor. That can pay a lot of bills, making your farmers market and CSA sales even more profitable. So those wanting to take their SPIN farms to the next level should think about heading to the basement or den or any other underutilized space in their home, and keep their commute time to 0. 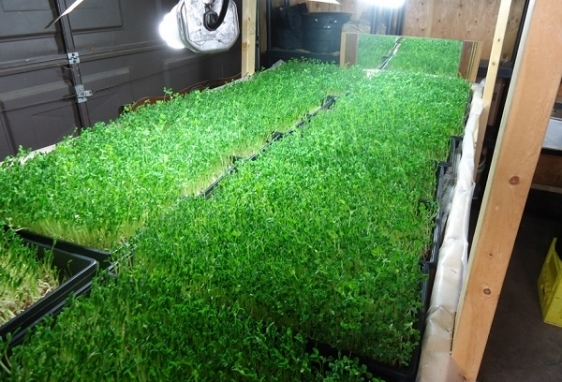 Find out how to set up a lucrative micro greens business in your basement in Dig Deeper Guide # 5.